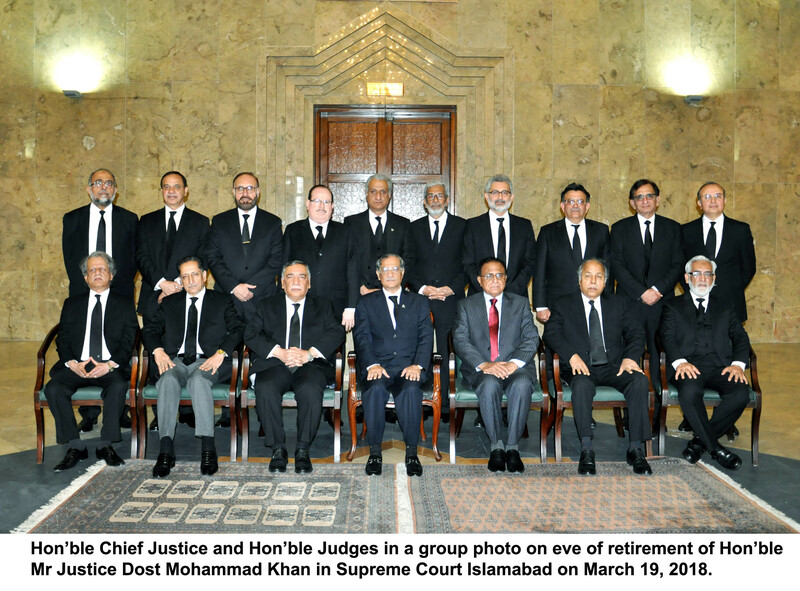 ISLAMABAD:(APS) Chief Justice of Pakistan Mr. Justice Mian Saqib Nisar and other Judges of Supreme Court of Pakistan bade farewell to Mr. Justice Dost Muhammad Khan, on his retirement today. A simple and dignified ceremony was held in honour of Mr. Justice Dost Muhammad Khan in Supreme Court of Pakistan, Islamabad today, which was attended by Chief Justice and all the Judges of Supreme Court. They lauded the professional and legal acumen of the Judge and praised his lordships devotion and dedication for the cause of justice. They also paid deepest regards to the Judge and prayed for his long, healthy, prosperous and productive life after his retirement as Judge, Supreme Court of Pakistan. They also presented souvenir and shields to Hon’ble Judge as token of respect and gesture of goodwill.